DJ’s Lawn Sprinklers has been providing the highest quality irrigation design, service, and installation for over 25 years. We design, install, and maintain underground lawn sprinklers & lawn irrigation systems from the Green Bay & Fox Valley Area, west to Madison & Sun Prairie, continuing south of Milwaukee to the State line. With offices in Milwaukee we are able to cater to every customer’s irrigation needs, be it service and maintenance or new residential/commercial installations. Long standing members of The Metropolitan Builders Association (MBA), Associated Builders and Contractors (ABC), National Association of Home Builders (NAHB), and the National Federation of Independent Business (NFIB). Participants in the Professional Contractors School of Business at the University of Notre Dame. Our employees have been with us for an average of 14 years. We have an A rating with “Angie’s List” and the Better Business Bureau. State of Wisconsin Certified Well Inspectors. State of Wisconsin Certified Cross Connection Control Testers. Full time, fully staffed office capable of dispatching our service technicians in a timely manner. Golden Shovel Award winner presented by Reinder’s Turf & Irrigation in 2006 and 2009. 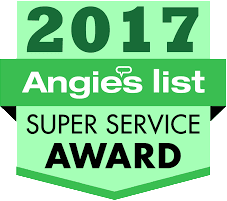 Winners of the 2013, 2014, 2015, and 2017 Angie’s List Super Service Award. DJ’s Lawn Sprinklers is committed to providing the highest quality repair and customer service to our customers all over Southeast Wisconsin. Since our company’s first service call in 1988 we have added nearly 3000 customers throughout the great State of Wisconsin. When you contact our fully staffed office you will speak to some of the friendliest, most professional office staff in the business. Our Service Technicians are some of the best in the business. We dispatch 3-4 service men on a daily basis. Our Service Technicians have worked for us for 11 years, 12 years, 13 years, and 18 years respectively. Their fully stocked service vehicles combined with years of knowledge allow us to fix the problem right the first time. All service calls (except for turn-ons and blow-outs, which are priced by the zone) are subject to a service charge and a per hour labor rate, which is billed in 15 minute increments after the first hour. This charge includes our costs of sending a skilled worker with a fully equipped vehicle to your house, the office help it takes to get your appointment scheduled quickly and efficiently, and other costs associated with taking care of you as a customer (printing, mailing, phone calls etc.). We are here to help you maintain a beautiful yard. If you see a problem, let us know right away. Please contact us today for all your irrigation service needs.